I'm super stoked today to have Cherie from you & mie as part of the Shorts on the Line Sewalong! She's seriously got the cutest little girl (seriously!) and sews her some seriously cute outfits all the time, like her braided beach maxi (in baby and mama versions), and her every little thing tunic top, among so many others! Cherie always has such great taste in her sewing, and today, she is going to share the adorable Figgy's Banyan Pattern in a very classy way that would suit any toddler! So glad you are here today, Cherie! Hello! My name is Cherie from you & mie. I'm so thrilled to be a part of this series because I. LOVE. SHORTS! I think they are super comfortable, perfect for warm or hot weather, and with all the different styles out there these days, they can be fashionable and practical. Shorts are especially great for my daughter who keeps herself busy with climbing, running, jumping and rolling, every chance she gets. I got to try out the Banyan Pattern from Figgy's and I was really psyched because I've been wanting to try their patterns for awhile now. I love the modern and sophisticated style of all their clothes. 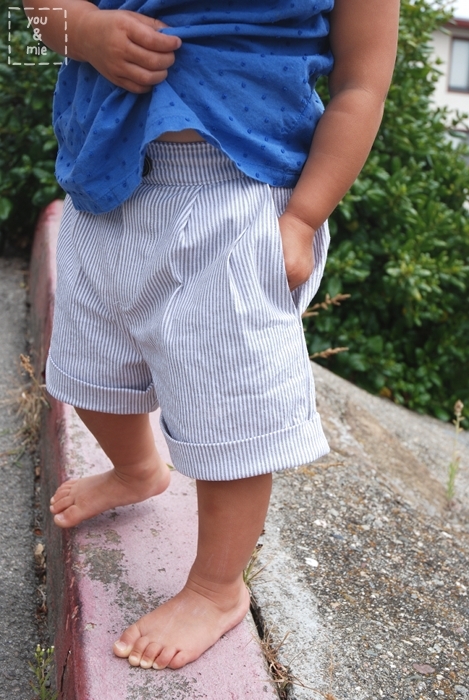 The Banyan set comes with a pattern for pants/shorts, a knit tee and a girl's knit tunic. All of the pieces are great staples for any collection. So far I've made the shorts, almost finished a pair of pants and though I have yet to try either of the tops, they are high on my to do list! I made the Banyan shorts in some sort of cotton fabric. I don't know the details, but it is a medium weight material with thin gray stripes on white. The pattern calls for a real zipper fly but I chickened out and just made a faux fly, so the only materials I used were the fabric, a bit of interfacing and one button. All things I had at home! I like that the shorts are roomy and easy to move around in. The front pockets are deep and my daughter already loves filling them to the brim with rocks. The style is simple and classic and I can imagine having a few pairs of these in different colors/prints. My daughter is just shy of 2 years, but she's extremely petite and her measurements matched closer with the 18 month measurements so that's what I made for her. The shorts are very roomy (even with her big cloth diapered bum!) and I know she'll be able to wear them for a long time, which I love. The pattern is pretty big compared to other 18-24 mo. sized pants we have, so you may want to keep that in mind. 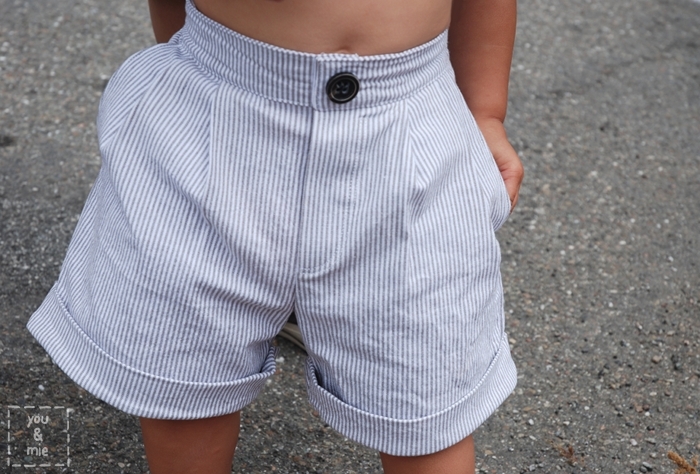 But with an elastic waistband, it's easy enough to adjust to fit any kid. The pattern has quite a few pieces (9, which ends up being 20 pieces of cut fabric and interfacing) because of all the pockets, the fly extension and the three-piece waistband. But everything is well labeled and it's easy enough to get them all cut out. Of course, I didn't even attempt the zipper fly, so I can't say anything about these directions. This is the part, I imagine, trips most people up, but there are some step by step directions on the Figgy's blog here, which seems quite helpful (in fact, I wish I had seen that before I made my shorts). I learned new ways to make slant pockets and the casing for the elastic waistband! Both were done in ways I had never seen before and I like learning different ways to do things. I think I'll be using both of these techniques again. The Banyan pattern is labeled "Intermediate" which I think is appropriate because there are quite a few steps and skills required, especially with the zipper fly. I think even an advanced beginner who is looking for a challenge could take this on! I really like the finished shorts and will definitely make them again. When I make them, I'll probably do the waistband differently just because I already have a method that I am comfortable with. I'll also attempt the zipper fly (eventually)! 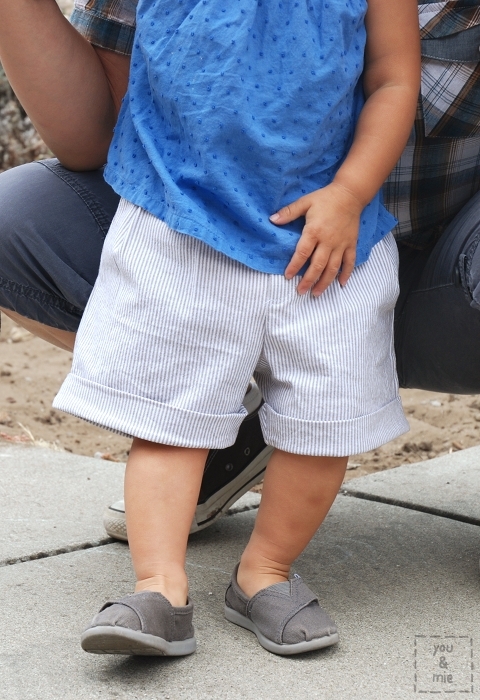 I love the tapered pants, which I think looks great on older kids. I also think that with a few adjustments, you can easily use this pattern to make some awesome boys shorts. Overall, this is a great pattern to have! Thank you to Shelly and Daniela from Figgy's for creating such beautiful styles and for giving me the opportunity to review this pattern. And to Vanessa, Rachael and Carla for hosting this awesome series and letting me be a part of it! 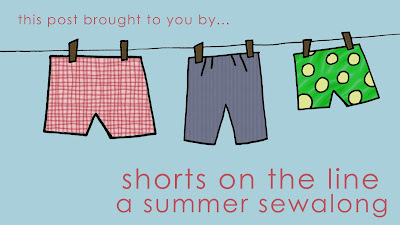 I hope you are all enjoying the shorts inspiration and please come by you & mie to stay hi some time!! Thanks you SO much, Cherie for the adorable shorts! I just love your fabric choice and leaving out the zipper, because, yes, what toddler would need that!? Just something else to fiddle with, haha!